The Minion War has spilled onto Rifts Earth and the epicenter of the invasion is North America. Two rival demonic forces fight to conquer the planet. 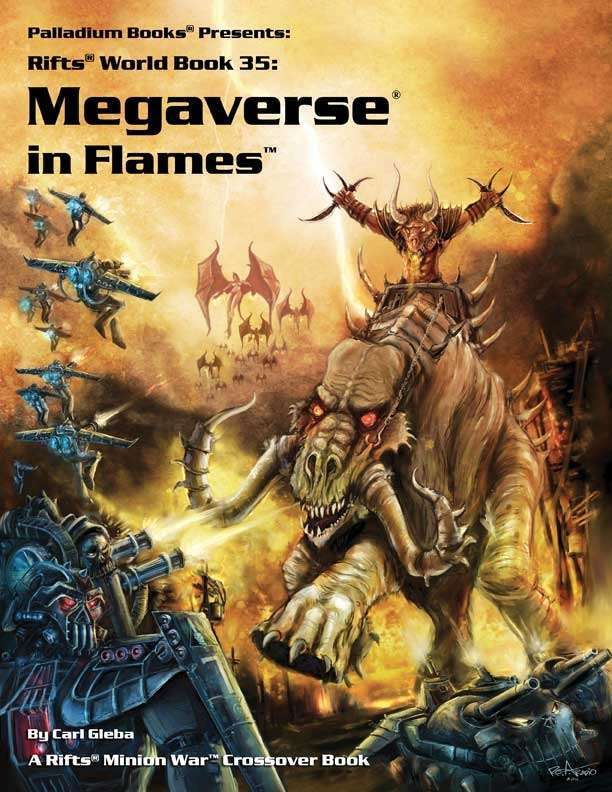 Hellspawned armies by the tens of thousands cross the dimensional divide, unleashing plagues, seeking out magic artifacts, recruiting monsters and mortal allies, and testing their strength against Earth’s mightiest military powers. Worse, they are building Hell Pits so they can unleash Hell on Earth! As demonic supernatural forces ramp up, enslave people and wreak havoc across the globe, the question becomes: Is this the beginning of a new Dark Age? 40+ new weapons, armor and vehicles including the Walking Death, Meat Grinder, Carnage Tank, Flesh Armor, Bone Armor, Chaos Warrior Armor, charms, talismans, weapons and more. Seven Demon Hell Lords and their armies. Seven Dyval Overlords and their armies. Seven Hell Plagues, Hell Pits and more. Calgary, the Kingdom of Monsters, Cuba and places of evil. It is battleground Earth! Part of the Minion War™ “Crossover” series. 192 pages, by Carl Gleba and Kevin Siembieda.